Ever wonder what life is really like for former boy band members? While some find renewed fame as solo acts, a few pop stars are finding savory success in an entirely different industry. The Boston-based hamburger business Wahlburgers, started by Mark, Donnie and Paul Wahlberg of New Kids on the Block fame, already has several locations throughout the U.S. with dozens more planned for the coming months. Now, Joey Fatone of 'NSync is ready to take on the fast food world with his restaurant Fat One’s, a hot dog spot in Orlando which opened last year. Fatone is seeing a lucrative future in the frankfurter business and he says he's hoping to open three more locations in the Sunshine state soon. He's even looking to open up shop in one of the country's most hot dog-loving cities, New York. But if you don't live in Florida or New York, fret not Fat One's fans. 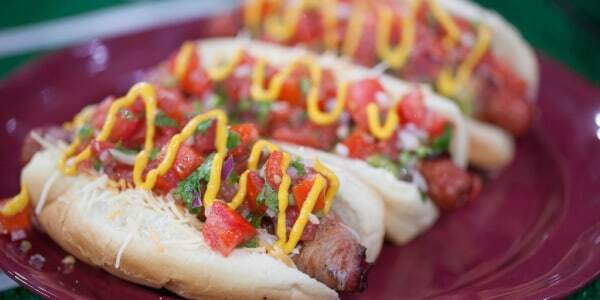 On Monday, Fatone debuted his hot dogs on HSN. That's right, for just $49.95 (or three easy payments of $16.65) you, too, can get a 24-pack of the singer's all-beef franks. Maybe more of our favorite boy band heartthrobs will get into the food game soon. TODAY’s editorial team decided to bring you this report on this item. TODAY has affiliate relationships, so we may get a small share of the revenue from your purchases. Items are sold by the retailer, not by TODAY. All prices are subject to change and items could sell out based on the merchant’s inventory.